Singles Knockout winner - Neil Inglis. Singles Knockout runner up - Phil Mead. Doubles Knockout winners - Neil Inglis & Norman Brittain. Doubles Knockout runners up - Ian Russell & Glen Kilpatrick. 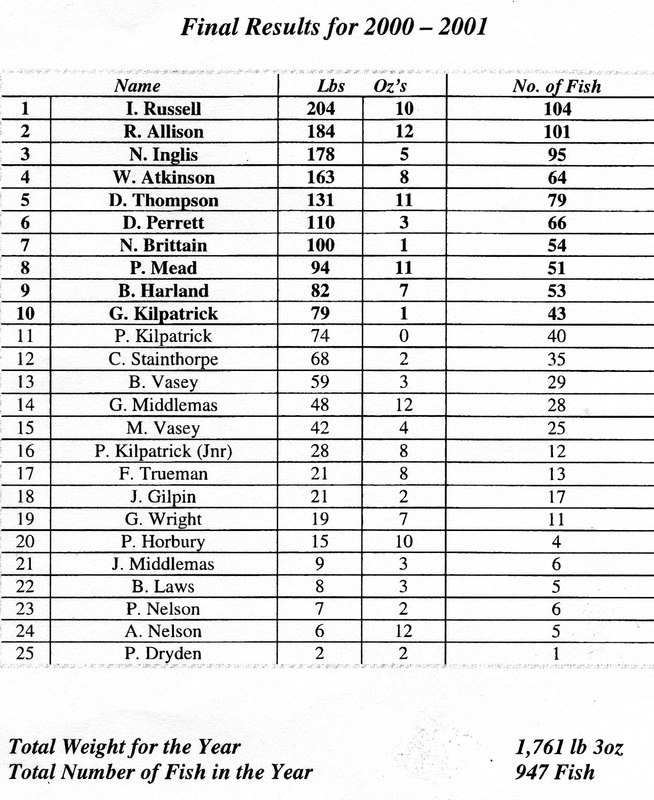 Greatest number of fish - Ian Russell - 104 fish. Heaviest Bag of Fish - Ian Russell - 24 lb 10 oz - 13 fish. 1st - Philip Kilpatrick - 28 lb 12 oz - 12 fish. 2nd - - lb oz - fish. Total weight for the season - 1,761 lb 03 oz. Total Number of fish - 947. Notes:- PDH 27/12/2012 from ledger. 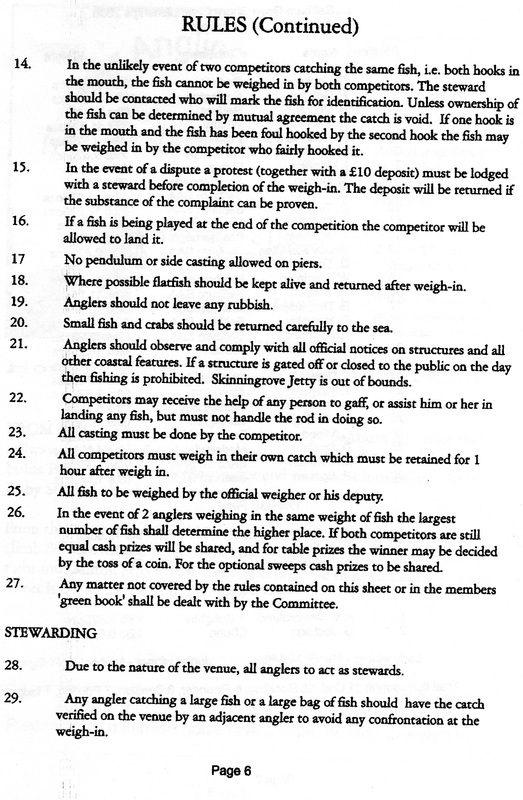 The first thing to note, there are no remarks in the columns for Heaviest Fish, these weights are taken from those who caught just 1 fish on the night night. 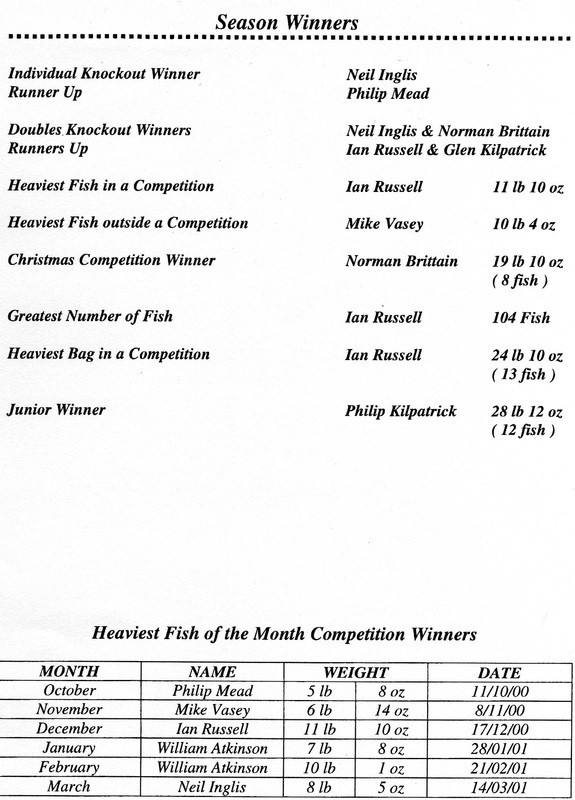 Nor any records for heaviest Fish caught out of competition. 11th October 2000 - Heaviest Bags. Phil Mead - 15 lb 05 oz - 6 fish. Brian Harland - 14 lb 13 oz - 9 fish. Ian Russell - 13 lb 14 oz - 4 fish. Dave Perrett - 11 lb 13 oz - 7 fish. Wednesday 8th November 2000 - Heaviest Bags. Ian Russell - 24 lb 10 oz - 13 fish. Rob Allison - 19 lb 11 oz - 8 fish. Neil Inglis - 18 lb 14 oz - 9 fish. Mike Vasey - 15 lb 11 oz - 6 fish. Denis Thompson - 13 lb 00 oz - 4 fish. George Middlemas - 11 lb 03 oz - 4 fish. Bernard Vasey - 10 lb 06 oz - 5 fish. 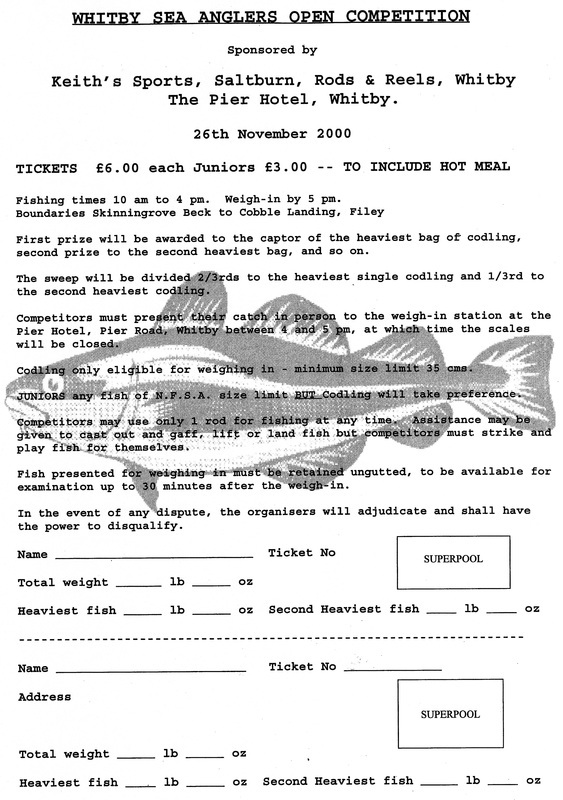 29th November 2000 - Peter Horbury Heaviest Fish 6 lb 08 oz. 17th December 2000 Heaviest Bags (Christmas Match). Norman Brittain - 19 lb 10 oz - 8 fish. Denis Thompson - 16 lb 12 oz - 6 fish. Ian Russell - 16 lb 02 oz - 4 fish, including one of 11 lb 10 oz. Rob Allison 15 lb 03 oz - 7 fish. 7th January 2001 - Rob Allison Heaviest Fish - 6 lb 08 oz. Ian Russell - 23 lb 10 oz - 7 fish. Colin Stainthorpe - 14 lb 15 oz - 3 fish. 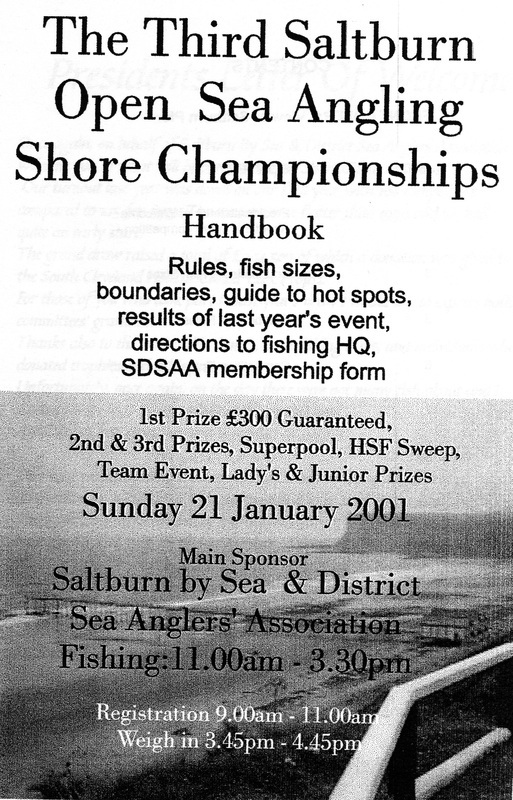 21st January 2001 - William Atkinson Heaviest bag 14 lb 07 oz - 7 fish. 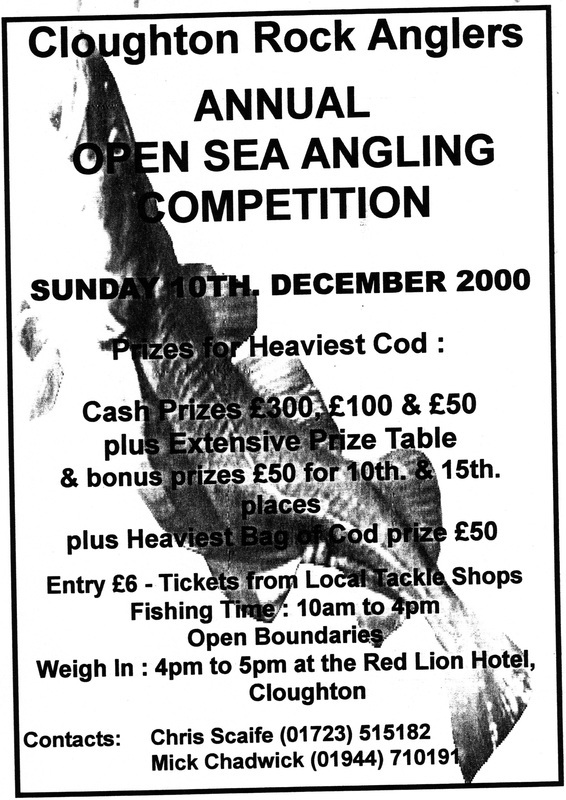 28th January 2001 - Phil Mead Heaviest Fish - 5 lb 00 oz. 4th February 2001 - Heaviest Bags. Glen Kilpatrick - 14 lb 01 oz - 6 fish. Rob Allison - 12 lb 14 oz - 5 fish. 7th February 2001 - Heaviest Bags. Rob Allison - 19 lb 08 oz. Paul Kilpatrick - 14 lb 09 oz - 6 fish. Brian Harland - 14 lb 02 oz - 3 fish. 18th February 2001 - Rob Allison Heaviest Bag - 16 lb 04 oz. 21st February 2001 - William Atkinson Heaviest Bag - 21 lb 14 oz - 4 fish. 28th February 2001 - Heaviest bags. William Atkinson - 13 lb 09 oz - 3 fish. Bernard Vasey - 12 lb 02 oz - 3 fish. 7th March 2001 - William Atkinson Heaviest bag 12 lb 02 oz - 3 fish. 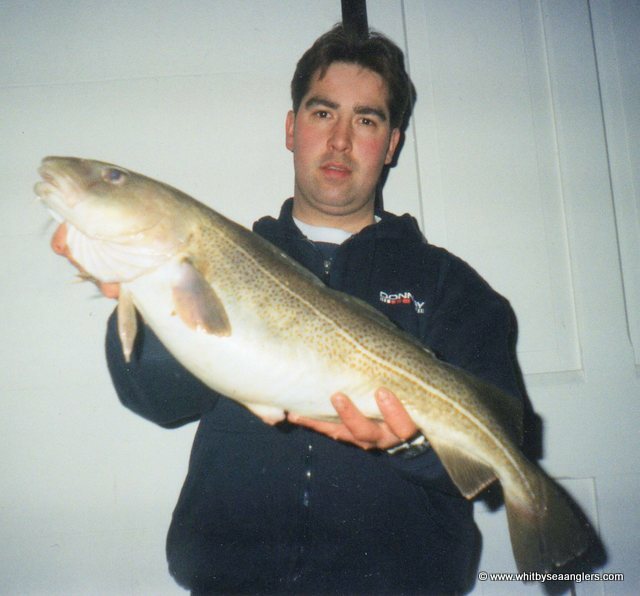 28th March 2001 - Neil Inglis Heaviest Fish - 4 lb 02 oz. ​As reported by Bernard Vasey to the Whitby Gazette. Started 22nd March 2013 PDH. Whitby Sea Anglers Association assembled at he Bandstand on a very wet and windy night to start the 2000 - 2001 winter shore angling seasons competitions which are fished every Sunday and Wednesday evenings through to the end of March. The sea conditions were fairly calm but 7 members managed to catch 10 fish. 1st - Rob Allison - 5 lb 08 oz - 3 fish. 2nd - Neil Inglis - 3 lb 09 oz - 1 fish, best fish of the match. 3rd - George Middlemas - 3 lb 03 oz - 3 fish. 4th - Dave Perrett - 2 lb 06 oz - 1 fish. 5th = Ian Russell - 1 lb 04 oz - 1 fish. 5th = Denis Thompson - 1 lb 04 oz - 1 fish. 7th - Colin Stainthorpe - 1 lb 00 oz - 1 fish. Sunday was a 4 hr match fishing from 6 pm to 10pm and gave an excellent result on a dry evening, fishing a high water into ebbing tide with a close to shore sea swell, Rob Allison once again found the fish winning with 6 for 10 lb 05 oz, along with the best cod of the evening 5 lb 01 oz. 1st - Rob Allison - 10 lb 05 oz - 6 fish, one of 5 lb 01 oz. 2nd - Glen Kilpatrick - 8 lb 05 oz - 6 fish. 3rd - Neil Inglis - 7 lb 01 oz - 3 fish. 4th - William Atkinson - 4 lb 13 oz - 1 fish. 5th - Norman Brittain - 4 lb 06 oz - 4 fish. 6th - Denis Thompson - 4 lb 01 oz - 3 fish. 7th - James Gilpin - 3 lb 13 oz - 5 fish. 8th - Ian Russell - 2 lb 02 oz - 2 fish. 9th = Philip Kilpatrick (Jnr) - 1 lb 03 oz - 1 fish. 9th = Colin Stainthorpe - 1 lb 03 oz - 1 fish. 11th - Bernard Vasey - 0 lb 14 oz - 1 fish. 12th - Bernard Vasey - 0 lb 08 oz - 1 fish. 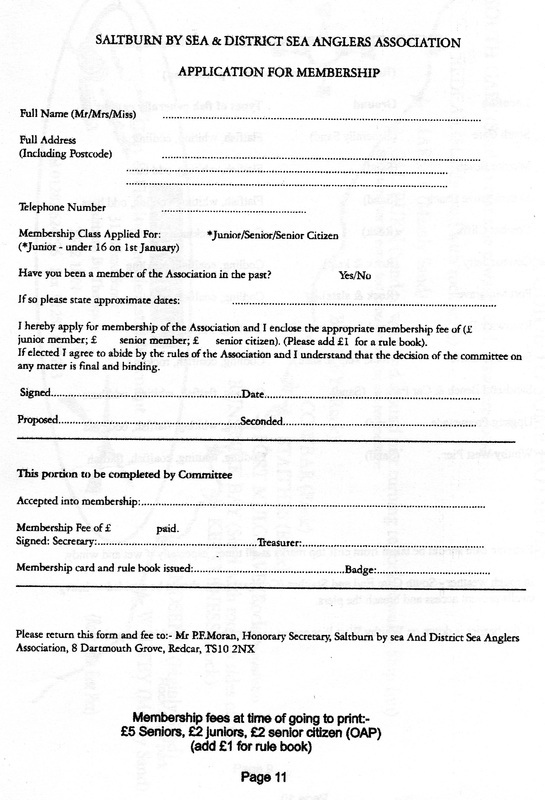 New members can still join. Whitby Sea Anglers Association fished to a high water tide on a flat calm night with a total of 11 assorted fish weighed in. Graham Wright had the heaviest fish, a codling of 2 lb 03 oz but Denis Thompson won with the heaviest bag 5 lb 01 oz, 3 fish and an eel which proved a slippery critter on the scales. 1st - Denis Thompson - 5 lb 01 oz - 4 fish. 2nd - William Atkinson - 2 lb 05 oz - 2 fish. 3rd - Graham Wright - 2 lb 03 oz - 1 fish. 4th - Philip Kilpatrick (Jnr) - 1 lb 03 oz - 1 fish. 5th - Glen Kilpatrick - 1 lb 00 oz - 1 fish. 6th = Neil Inglis - 0 lb 09 oz - 1 fish. 6th = Brian Harland - 0 lb 09 oz - 1 fish. Sunday’s match was much the same conditions as Wednesday except anglers were able to go onto the scaurs and fish a low water into a flooding tide. Although a more active night than Wednesday’s match with 21 fish weighed in, the heaviest single fish of only 1 lb 11 oz, from a selection of codling, billet and rockling. 1st - George Middlemas - 4 lb 04 oz - 4 fish. 2nd - Rob Allison - 3 lb 14 oz - 3 fish. 3rd - Phil Mead - 3 lb 12 oz - 3 fish. 4th - Ian Russell - 2 lb 04 oz - 2 fish. 5th - Dave Perrett - 2 lb 00 oz - 2 fish. 6th - Neil Inglis - 1 lb 13 oz - 2 fish. 7th - Norman Brittain - 1 lb 05 oz - 1 fish. 8th = Colin Stainthorpe - 1 lb 04 oz - 1 fish. 8th = James Gilpin - 1 lb 04 oz - 1 fish. 10th - Denis Thompson - 0 lb 12 oz - 1 fish. 11th - Mike Vasey - 0 lb 10 oz - 1 fish. 1st - Phil Mead - 15 lb 05 oz - fish, one of 5 lb 08 oz. 2nd - Brian Harland - 14 lb 13 oz - 5 fish. 3rd - Ian Russell - 13 lb 14 oz - 9 fish. 4th - Dave Perrett - 11 lb 13 oz - 7 fish. 5th - Denis Thompson - 4 lb 15 oz - 5 fish. 6th - Paul Kilpatrick - 4 lb 11 oz - 3 fish. 7th - Neil Inglis - 4 lb 05 oz - 1 fish. 8th - Philip Kilpatrick (Jnr) - 2 lb 10 oz - 2 fish. 9th = Colin Stainthorpe - 1 lb 15 oz - 1 fish. 9th = Rob Allison - 1 lb 15 oz - 1 fish. 11th = William Atkinson - 1 lb 13 oz - 1 fish. 11th = Glen Kilpatrick - 1 lb 13 oz - 1 fish. 13th - Bernard Vasey - 1 lb 05 oz - 1 fish. A top of the tide competition for Whitby Sea Anglers Association and a calm sea still produced a total of 28 fish, ranging from flatties, billet, rockling and codling, the heaviest fish a 3 lb 09 codling from Neil Inglis. 1st - Ian Russell - 5 lb 13 oz - 5 fish. 2nd - William Atkinson - 5 lb 12 oz - 5 fish. 3rd - Neil Inglis - 5 lb 11 oz - 3 fish. 4th - Denis Thompson - 3 lb 05 oz - 3 fish. 5th - Paul Kilpatrick - 3 lb 01 oz - 3 fish. 6th - Colin Stainthorpe - 2 lb 15 oz - 2 fish. 7th - George Middlemas - 2 lb 00 oz - 2 fish. 8th - Phil Mead - 1 lb 14 oz - 2 fish. 9th - Dave Perrett - 1 lb 07 oz - 1 fish. 10th - Rob Allison - 1 lb 02 oz - 1 fish. 11th - Glen Kilpatrick - 0 lb 08 oz - 1 fish. 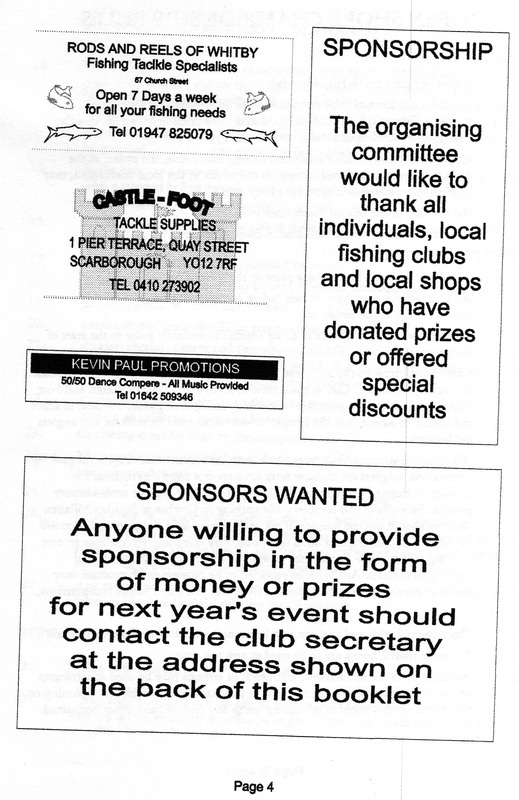 Whitby Sea Anglers Association Annual Open 26th November 2000. The sea conditions remained calm for Whitby Sea Anglers Association club match as 14 fish were weighed in, in another top of the tide event with the water quite clear and a very little sea swell moving as most of the activity was coming from crabs. 1st - Neil Inglis - 7 lb 04 oz - 4 codlings, one of 2 lb 07 oz. 2nd - Dave Perrett - 3 lb 14 oz - 2 fish. 3rd - Colin Stainthorpe - 3 lb 04 oz - 2 fish. 4th - Rob Allison - 2 lb 02 oz - 1 fish. 5th - George Middlemas - 1 lb 11 oz - 1 fish. 6th - Paul Kilpatrick - 1 lb 05 oz - 1 fish. 7th - Denis Thompson - 1 lb 04 oz - 1 fish. 8th = Adrian Nelson - 1 lb 02 oz - 1 fish. 8th = Glen Kilpatrick - 1 lb 02 oz - 1 fish. There was a touch of south easterly and a low water to flood tide enabled anglers to choose better marks on the scaurs to fish, with a slight sea swell close to shore this put little colour in the water, but results for Whitby Sea Anglers Association members were much the same as Wednesday, with billet, rockling, codling and a pouting tipping the scales. 1st - Glen Kilpatrick - 3 lb 12 oz - 3 fish. 2nd - Dave Perrett - 2 lb 04 oz - 2 fish. 3rd - Bernard Vasey - 1 lb 09 oz - 1 fish. 4th - James Gilpin - 1 lb 07 oz - 1 fish. 5th - Neil Inglis - 1 lb 03 oz - 1 pouting. 6th = Brian Harland - 1 lb 01 oz - 1 fish. 6th = George Middlemas - 1 lb 01 oz - 1 fish. 8th - Paul Nelson - 0 lb 14 oz - 1 fish. 9th - Colin Stainthorpe - 0 lb 09 oz - 1 fish. 10th - William Atkinson - 0 lb 07 oz - 1 fish. Strong winds and rain on Monday and Tuesday had eased off for Whitby Sea Anglers Association members club match, turning to a southerly sea swell that provided plenty of movement and colour for anglers to fish a half ebbing tide that produced a total of 34 fish from 15 members. Paul Kilpatrick had an active night, catching a fish on his first cast and went on to win the match with 5 fish for 8 lb 09 oz. 1st - Paul Kilpatrick - 8 lb 09 oz - 5 fish. 2nd - George Middlemas - 4 lb 05 oz - 4 fish. 3rd - Bernard Vasey - 4 lb 04 oz - 4 fish. 4th - Neil Inglis - 4 lb 01 oz - 2 fish. 5th - Norman Brittain - 4 lb 00 oz - 3 fish. 6th - Ian Russell - 3 lb 11 oz - 4 fish. 7th - Dave Perrett - 3 lb 00 oz - 2 fish. 8th - Glen Kilpatrick - 2 lb 15 oz - 2 fish. 9th - Philip Kilpatrick (Jnr) - 2 lb 11 oz - 1 fish. 10th - Mike Vasey - 2 lb 09 oz - 2 fish. 11th = James Gilpin - 2 lb 08 oz - 2 fish. 11th = Brian Harland - 2 lb 08 oz - 2 fish. 13th - Rob Allison - 1 lb 12 oz - 1 fish. 14th - Graham Wright - 0 lb 14 oz - 1 fish. 15th - Colin Stainthorpe - 0 lb 11 oz - 1 fish. A calm sea due to southerly gales and heavy rain over the weekend spoiled most of the marks but the rain did fall away during the match for Whitby Sea Anglers Association members to fish a 5.7 metre ebbing tide. A number of members fished Redcar Open competition during the day and only 6 fished the clubs evening match with 5 weighing in. 1st - Neil Inglis - 4 lb 10 oz - 4 fish. 2nd - Dave Perrett - 4 lb 08 oz - 4 fish. 3rd - Phil Mead - 2 lb 08 oz - 2 fish. 4th - Ian Russell - 1 lb 05 oz - 1 fish. 5th - Glen Kilpatrick - 1 lb 02 oz - 1 fish. John Smiths Open 12th November 2000. 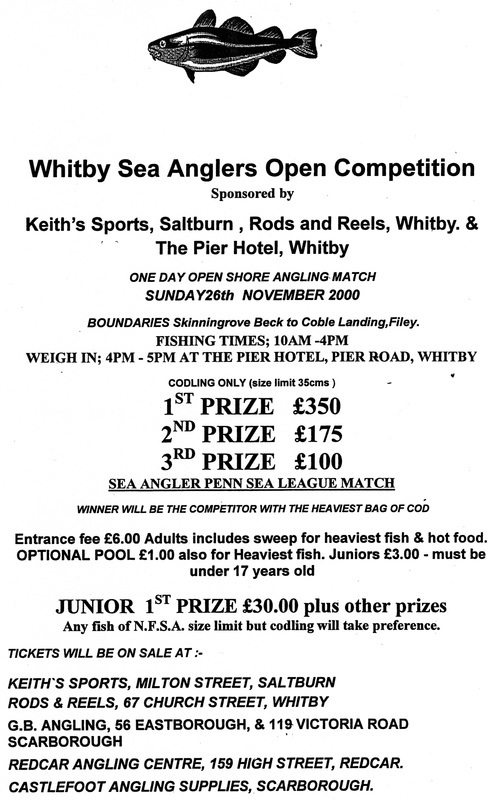 Whitby Sea Anglers Association Open 26th November 2000. Whitby Sea Anglers Association angler Neil Inglis continues to find the fish as he weighed in 3 codlings for 5 lb 02 oz to win the match and take him into 1st place overall with a total of 45 lb 04 oz from 25 fish. It was a high water ebb match with no wind or rain to spoil the nights fishing, a long distant sea swell was running to create enough movement for the fish to become active and look for food. 13 fish were weighed in. 1st - Neil Inglis - 5 lb 02 oz - 3 fish. 2nd - Mike Vasey - 3 lb 07 oz - 2 fish (lost another 2 off). 3rd - Glen Kilpatrick - 3 lb 01 oz - 2 fish. 4th - Bernard Vasey - 2 lb 10 oz - 1 fish, heaviest fish of the night. 5th - William Atkinson - 2 lb 01 oz - 1 fish. 6th - Rob Allison - 1 lb 08 oz - a bass. 7th - Graham Wright - 1 lb 02 oz - 2 fish. 8th - Ian Russell - 0 lb 07 oz - 1 fish. A calm sea state for the Sunday match, starting fishing with the tide 1 hr into its flood also a change in the weather, with the wind increasing and heavy rain fall followed as the night went on. But despite all this 2 members did exceptionally well, fishing together they caught 5 fish apiece, Phil Mead had the better bag 8 lb 12 oz and Dave Perrett 7 lb 03 oz. 1st - Phil Mead - 8 lb 12 oz - 5 fish. 2nd - Dave Perrett - 7 lb 03 oz - 5 fish. 3rd - Denis Thompson - 5 lb 10 oz - 4 fish. 4th - Ian Russell - 2 lb 03 oz - 2 fish. 5th - William Atkinson - 1 lb 04 oz - 2 fish. 6th - James Gilpin - 0 lb 15 oz - 1 fish. 7th - Norman Brittain - 0 lb 08 oz - 1 fish. There was also a result in the first round of the singles knockout competition fished over the previous matches. 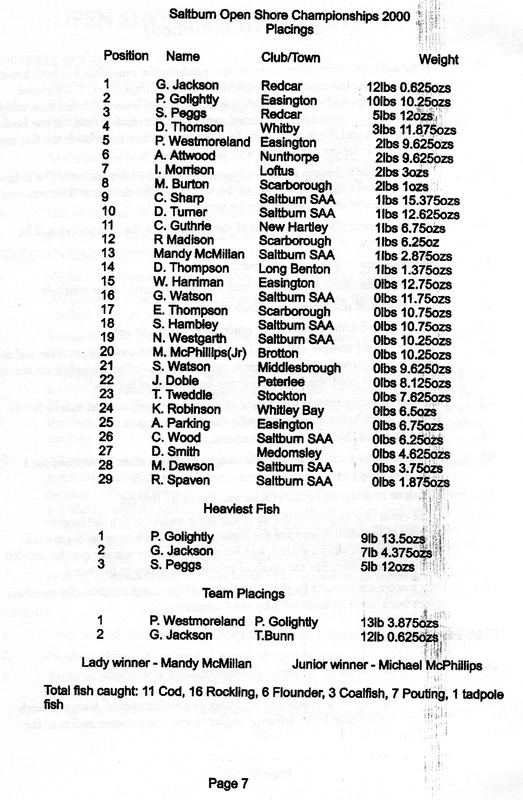 The best night for Whitby Sea Anglers Association members for some years resulted in a total of 85 fish weighing in 184 lb 07 oz from 20 members. Strong winds on Monday and Tuesday had eased for the club match with a north westerly sea swell, the best sea conditions this season and an ebbing tide with low water at 7.46 hrs, members were able to fish the scaurs. There were 7 double figure bags, the heaviest bag from Ian Russell with 13 fish, Mike Vasey caught the heaviest single fish, a cod of 6 lb 14 oz, George Middlemas had a second of 6 lb 07 oz, Philip Kilpatrick (Jnr) one of 5 lb 04 oz and a few more in the 4 lb to 5 lb range. 1st - Ian Russell - 24 lb 10 oz - 13 fish. 2nd - Rob Allison - 19 lb 11 oz - 8 fish. 3rd - Neil Inglis - 18 lb 14 oz - 9 fish. 4th - Mike Vasey - 15 lb 11 oz - 6 fish. 5th - Denis Thompson - 13 lb 00 oz - 4 fish. 6th - George Middlemas - 11 lb 03 oz - 4 fish. 7th - Bernard Vasey - 10 lb 06 oz - 5 fish. 8th - Norman Brittain - 9 lb 02 oz - 5 fish. 9th - Glen Kilpatrick - 8 lb 13 oz - 4 fish. 10th - Brian Harland - 7 lb 06 oz - 3 fish. 11th - Dave Perrett - 7 lb 04 oz - 4 fish. 12th - Graham Wright - 6 lb 15 oz - 2 fish. 13th - Philip Kilpatrick (Jnr) - 6 lb 13 oz - 2 fish. 14th - William Atkinson - 6 lb 04 oz - 2 fish. 15th - Phil Mead - 5 lb 05 oz - 4 fish. 16th - James Gilpin - 5 lb 04 oz - 4 fish. 17th - Paul Kilpatrick - 2 lb 14 oz - 2 fish. 18th - Paul Nelson - 2 lb 09 oz - 2 fish. 19th - Colin Stainthorpe - 1 lb 08 oz - 1 fish. 20th - Adrian Nelson - 0 lb 15 oz - 1 fish. Although the sea had calmed for the Sunday Whitby Sea Anglers Association competition there was enough swell close to shore from a south easterly fast ebbing tide. A bag of 18 lb 10 oz, 8 fish, the heaviest fish being 3 lb 14 oz from Ian Russell won him his second place in a row, also overtaking Neil Inglis into first place overall. 1st - Ian Russell - 18 lb 10 oz - 8 fish. 2nd - Norman Brittain - 9 lb 13 oz - 5 fish, who struggled to pull through the weed. 3rd - Denis Thompson - 8 lb 06 oz - 4 fish, heaviest fish 4 lb 15 oz. 4th - George Middlemas - 4 lb 15 oz - 2 fish. 5th - William Atkinson - 3 lb 14 oz - 3 fish. 6th - Paul Kilpatrick (Jnr) - 3 lb 12 oz - 1 fish. 7th - Paul Nelson - 3 lb 11 oz - 3 fish. 8th - Neil Inglis - 2 lb 10 oz - 2 fish. 9th - Colin Stainthorpe - 2 lb 04 oz - 1 fish. 10th - Paul Kilpatrick - 1 lb 10 oz - 1 fish. 11th - Phil Mead - 0 lb 11 oz - 1 fish. 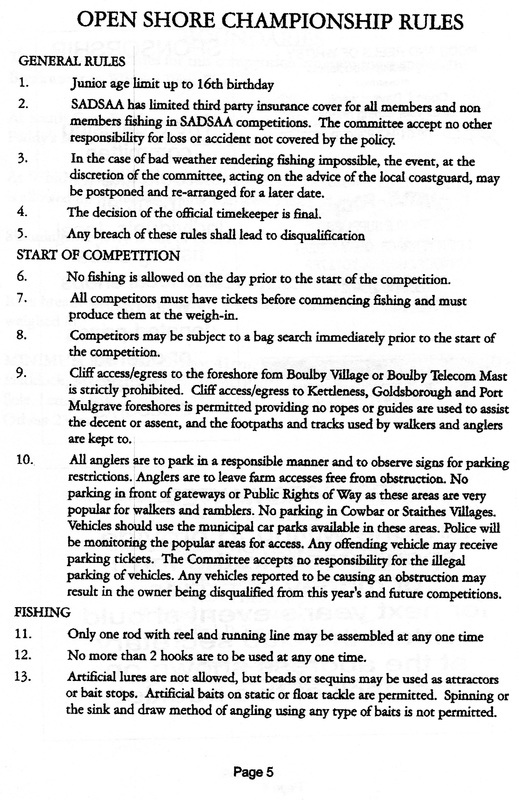 Sunday was also the Filey Brigg Angling Society’s “John Smiths Open” which was a heaviest fish competition fishing 9am to 3pm. The first place prize of ££50 was presented to Mick Ellis, of Scarborough with a single cod of 5 lb 12¾ oz. Second place was Richard Haxby 5 lb 06¾ oz. Third place was Martin Haxby 5 lb 03½ oz. The heaviest bag of the day sweep was won by Ray Maddison, of Scarborough 15 lb 12¼ oz. ​A total of 102 anglers fished. 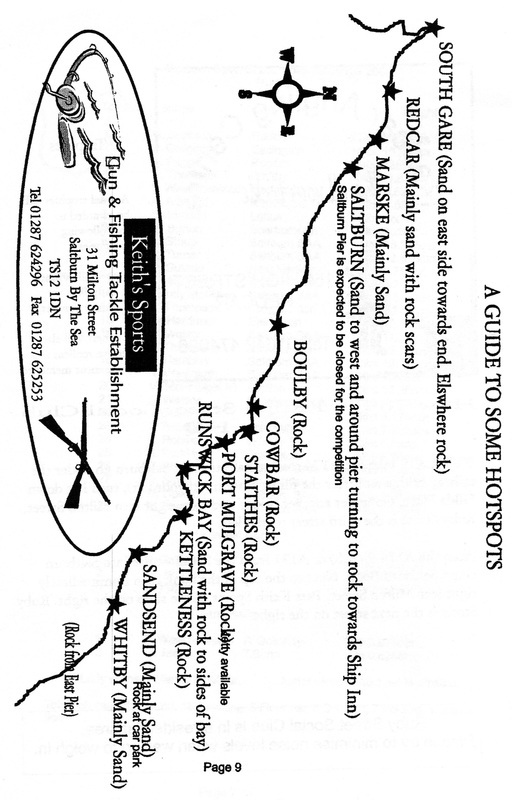 Keith’s Sports of Saltburn & Rods and Reels, Whitby. The calm sea continued for Whitby Sea Anglers Association members in the Wednesday competition, the high tide only created movement once it started to ebb, results were much as expected with a total of 18 fish weighed in, nearly all codling. 1st - Neil Inglis - 5 lb 00 oz - 4 fish. 2nd - George Middlemas - 4 lb 11 oz - 2 fish, heaviest fish 2 lb 06 oz. 3rd - Rob Allison - 4 lb 07 oz - 4 fish. 4th - Glen Kilpatrick - 2 lb 04 oz - 1 fish. 5th - William Atkinson - 2 lb 00 oz - 1 fish. 6th - Bernard Vasey - 1 lb 14 oz - 1 fish. 7th - Norman Brittain - 1 lb 09 oz - 1 fish. 8th - Jimmy Middlemas - 1 lb 07 oz - 1 fish. 9th - Paul Kilpatrick - 1 lb 02 oz - 1 fish. 10th - Ian Russell - 1 lb 01 oz - 1 fish. 11th - Mike Vasey - 1 lb 00 oz - 1 fish. With a light south westerly breeze it was a cool dry night as a calm sea flooded in the 4 hr match, for Whitby Sea Anglers Association members codling were scarce as they prefer to come close to shore to feed in a rough sea. Whiting were the fish on the menu and Rob Allison was kept busy with 8 fish for 6 lb 09 oz, 1 dab, which was released alive after weighing in. 1st - Rob Allison - 6 lb 09 oz - 8 fish. 2nd - Neil Inglis - 3 lb 15 oz - 2 codlings. 3rd - Phil Mead - 2 lb 10 oz - 2 fish. 4th - Dave Perrett - 2 lb 04 oz - 1 fish, heaviest fish of the night. 5th - Denis Thompson - 1 lb 07 oz - 1 fish. 6th - Glen Kilpatrick - 1 lb 03 oz - 1 fish. 7th - Adrian Nelson - 0 lb 15 oz - 1 fish. 8th - William Atkinson - 0 lb 11 oz - 1 fish. 9th - Ian Russell - 0 lb 08 oz - 1 fish. 10th - Brian Harland - 0 lb 07 oz - 1 fish. Whitby Sea Anglers Association members fished to a strong south westerly wind and a low water into flooding tide with William Atkinson winning with 7 lb 13 oz, 3 fish. 1st - William Atkinson - 7 lb 13 oz - 3 fish. 2nd - Glen Kilpatrick - 7 lb 11 oz - 4 fish. 3rd - Dave Perrett - 4 lb 10 oz - 2 fish. 4th - Neil Inglis - 4 lb 06 oz - 2 fish. 5th = Ian Russell - 3 lb 09 oz - 2 fish. 5th = Rob Allison - 3 lb 09 oz - 2 fish. 7th - George Middlemas - 2 lb 09 oz - 1 fish. 8th - Colin Stainthorpe - 2 lb 03 oz - 1 fish. 9th - Phil Mead - 1 lb 11 oz - 1 fish. 10th - Denis Thompson - 1 lb 08 oz - 1 fish. 11th - Mike Vasey - 1 lb 03 oz - 1 fish. 12th - Brian Harland - 1 lb 02 oz - 1 fish. 13th - Norman Brittain - 0 lb 11 oz - 1 fish. 14th - Graham Wright - 0 lb 09 oz - 1 fish. Cloughton Rock Anglers Open 10th December 2000. 1st prize £300, 2nd prize £100, 3rd prize £50. Whitby Sea Anglers Association held their Annual Open Shore competition, although it was a fine sunny day there was a very strong westerly wind present, which made casting quite difficult, but the sea conditions were fairly good with a lose to shore sea swell and plenty of colour in the water. The fishing time was from 10am to 4pm along the coast in boundaries of Skinningrove Beck to Coble Landing, Filey, with 137 anglers taking part, 9 were juniors, resulting in 50 anglers weighing-in 108 fish for a total weight of 196 lb. The 1st place prize and the Whitby Open Trophy for the heaviest bag of codling were presented to Gary Watson, of Middlesbrough with 13 lb 02½ oz from 4 fish. The 2nd place prize of £175 to Rob Allison, of Loftus, 9 lb 08 oz, 4 fish. The 3rd place prize of £100 to Mark Wilson, of Whitby with 8 lb 13 oz, 5 fish. The sweep for the heaviest single fish was also won by Gary Watson with a cod of 6 lb 07 oz, 2nd heaviest single fish William Atkinson, of Egton, 5 lb 09 oz. The £30 Junior prize was won by Redcar angler Chris Routledge with 5 lb 03 oz, 2 codlings. The 2nd place to Shane France, of Scarborough, 4 lb 03 oz, 3 codlings. 3rd place to Mathew Hillaby, of Scarborough, 3 lb 02 oz, 2 codlings. 3rd - Mark Wilson, of Whitby - 8 lb 13 oz - 5 fish. 4th = Pete Bayes - 7 lb 15 oz - 5 fish. 4th = H Cook - 7 lb 15 oz - 3 fish. 6th - Eric Thompson - 7 lb 06 oz - 4 fish. 7th - Tennent - 7 lb 02 oz - 4 fish. 8th - Neil Inglis - 6 lb 09 oz - 4 fish. 9th - M Jackson - 6 lb 07½ oz - 2 fish. 10th - Ian Russell - 6 lb 01 oz - 3 fish. 11th - M Smith - 5 lb 08½ oz - 4 fish. 12th - P Atkinson - 5 lb 05 ½ oz - 3 fish. 13th - Denis Thompson - 5 lb 03½ oz - 3 fish. 14th - Norman Brittain - 5 lb 02 oz - 3 fish. 15th - D Kendal - 4 lb 12 oz - 4 fish. 16th - A Dobson - 4 lb 04 oz - 3 fish. 17th - G Hicks - 4 lb 03 oz - 2 fish. 18th - P France - 4 lb 00 oz - 2 fish. 19 members entered and 13 weighed in. Weight - 53 lb 02 oz. 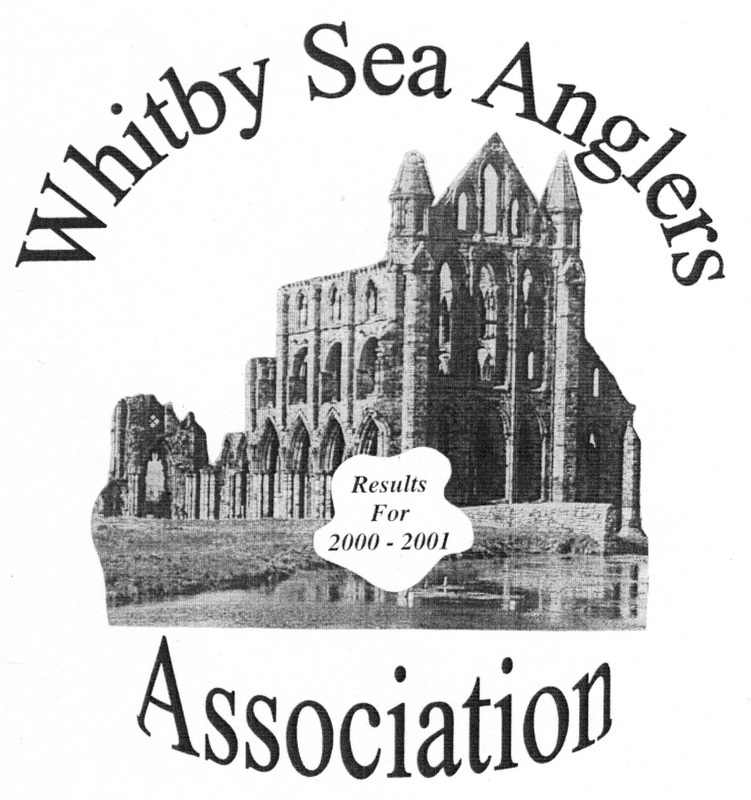 The sea conditions remained calm as a strong westerly wind once again limited marks where to fish but at least it was a dry evening as Whitby Sea Anglers Association members began to fish with the tide on its ebb. Peter Horbury has removed the dust from his fishing gear and rejoined the club and weighed in a fine cod of 6 lb 08 oz to win the nights event. 1st - Peter Horbury - 6 lb 08 oz - 1 codling. 2nd - Neil Inglis - 5 lb 02 oz - 2 rocklings, 2 codlings. 3rd - Norman Brittain - 4 lb 05 oz - 2 codlings. 4th - Phil Mead - 3 lb 00 oz - 2 fish. 5th - Ian Russell - 2 lb 08 oz - 1 fish. 6th - Dave Perrett - 2 lb 04 oz - 1 fish. 7th - Glen Kilpatrick - 1 lb 11 oz - 1 fish. 8th - Colin Stainthorpe - 1 lb 04 oz - 1 fish. 9th - Adrian Nelson - 1 lb 03 oz - 1 fish. 10th - Rob Allison - 1 lb 00 oz - 2 fish. 11th - Ben Laws - 0 lb 12 oz - 1 fish. 12th - Farron Trueman - 0 lb 08 oz - 1 fish. 13th - Graham Wright - 0 lb 06 oz - 1 fish. High water flood into an ebb tide with very little movement in the sea as 11 assorted fish were weighed in by Whitby Sea Anglers Association members, the heaviest bag was won by Norman Brittain - 3 lb 01 oz, 2 codlings. 1st - Norman Brittain - 3 lb 01 oz - 1 fish. 2nd - Neil Inglis - 2 lb 08 oz - 1 fish, heaviest fish of the night. 3rd - Brian Harland - 2 lb 00 oz - 2 fish. 4th - Dave Perrett - 1 lb 09 oz - 1 fish. 5th - Farron Trueman - 1 lb 05 oz - 1 fish. 6th - Ian Russell - 0 lb 09 oz - 1 fish. 7th - William Atkinson - 0 lb 08 oz - 1 fish. Ship Inn Open 7th January 2001. A small tide just starting to flood was fished by Whitby Sea Anglers Association with a strong southerly wind present, a total of 13 fish were caught, the heaviest fish of 3 lb 03 oz going to Neil Inglis. In this match there was a final result in the doubles knockout competition as Neil Inglis & Norman Brittain beat Ian Russell & Glen Kilpatrick by 9 lb 06 oz to 3 lb 03 oz. 1st - Neil Inglis - 5 lb 10 oz - 2 fish. 2nd - Norman Brittain - 3 lb 12 oz - 2 fish. 3rd - Rob Allison - 2 lb 13 oz - 1 fish. 4th - Ian Russell - 2 lb 05 oz - 1 fish. 5th - Denis Thompson - 1 lb 13 oz - 1 fish. 6th - Mike Vasey - 1 lb 09 oz - 1 fish. 7th - Brian Harland - 1 lb 06 oz - 2 fish. 8th - Glen Kilpatrick - 1 lb 02 oz - 1 fish. 9th - Paul Kilpatrick - 1 lb 01 oz - 1 fish. 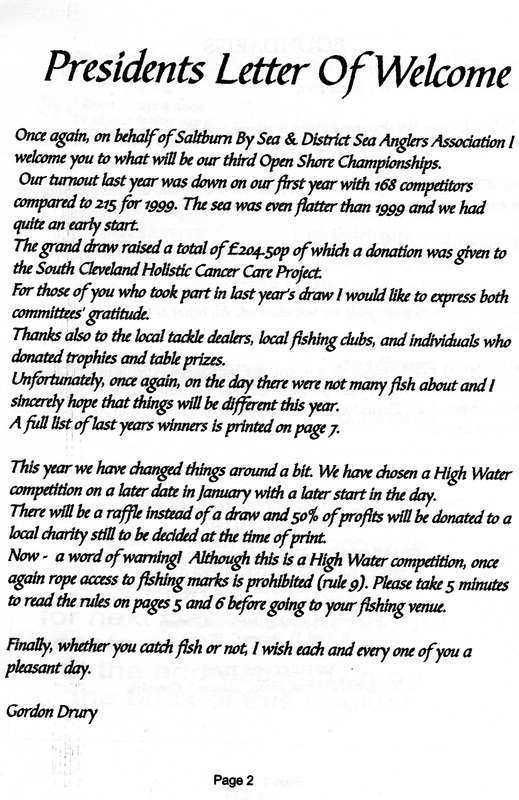 Sunday 10th Dec 2000 - Cloughton Rock Anglers Open. The Annual Cloughton Open match competition was fished for the heaviest single cod, fishing from 10am to 4pm and weigh in at the Red Lion, Cloughton. 31 anglers caught fish with just over 100 anglers taking part as the tide flooded into a southerly gentle swell. The prize of £50 for the heaviest bag of fish was won by Chris Scaife 9 lb 04½ oz, 5 fish. There were two bonus prizes of £50 for 10th & 15th places won by Neil Inglis 2 lb 06 7/8 oz and Chris Scaife 2 lb 02½ oz respectively. 3rd - Steve Ianson - 5 lb 01 oz. 4th - Ian Thompson - 4 lb 07 oz. 5th - Michael Readman (Jnr) - 3 lb 06 oz. 6th - Paul Medd - 3 lb 01 oz. 7th - Martin Haxby - 2 lb 12 oz. 8th - J Robinson - 2 lb 11 oz. 9th - Frank Colling - 2 lb 09 oz. 10th - Neil Inglis - 2 lb 06 oz. This was also a Whitby Sea Anglers Association club match with the winner of the heaviest bag going to Neil Inglis - 3 lb 10 oz - 2 fish. 1st - Neil Inglis - 3 lb 10 oz - 2 fish. 2nd - Ian Russell - 2 lb 09 oz - 2 fish. 3rd - Dave Perrett - 1 lb 12 oz - 1 fish. 4th - Mike Vasey - 1 lb 09 oz - 1 fish. 5th - Brian Harland - 1 lb 07 oz - 1 fish. Neils’ catch now takes him over the 100 lb barrier for the season to 103 lb 08 oz. The sea state was kept fairly calm due to a strong westerly wind again making casting difficult. 1st - Denis Thompson - 7 lb 08 oz - 3 fish. 2nd - Neil Inglis - 5 lb 15 oz - 3 fish. 3rd - Ian Russell - 5 lb 14 oz - 2 fish, heaviest fish 4 lb 01 oz of the night. 4th - Dave Perrett - 4 lb 02 oz - 3 fish. 5th - Jimmy Middlemas - 3 lb 14 oz - 3 fish. 6th - Bernard Vasey - 1 lb 08 oz - 1 fish. 7th - Colin Stainthorpe - 0 lb 11 oz - 1 fish. There were plenty of anglers fishing on Friday and Saturday evening on the west pier as a good north westerly sea brought the fish in closer to feed with reports of good bags and descent fish being caught. ​Conditions continued for the Whitby Sea Anglers Association members Christmas match as 16 members weighing-in 47 fish with 4 double figure bags. The winner of the Christmas Cup was won by Norman Brittain with the heaviest bag of 19 lb 11 oz from 8 fish. The winner of the heaviest fish fell to Ian Russell, 11 lb 10 oz (also the best this season) his bag of 16 lb 02 oz, 4 fish. Number of members fishing is not recorded but 16 members did weigh in. Heaviest Fish - Ian Russell - 11 lb 10 oz. 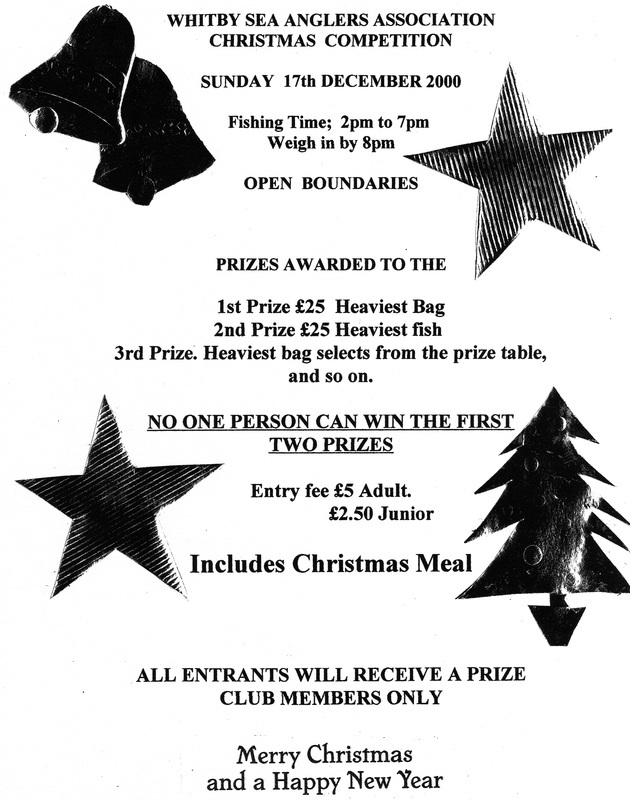 The Lythe Open Match at the Stiddy, 29th December 2000. 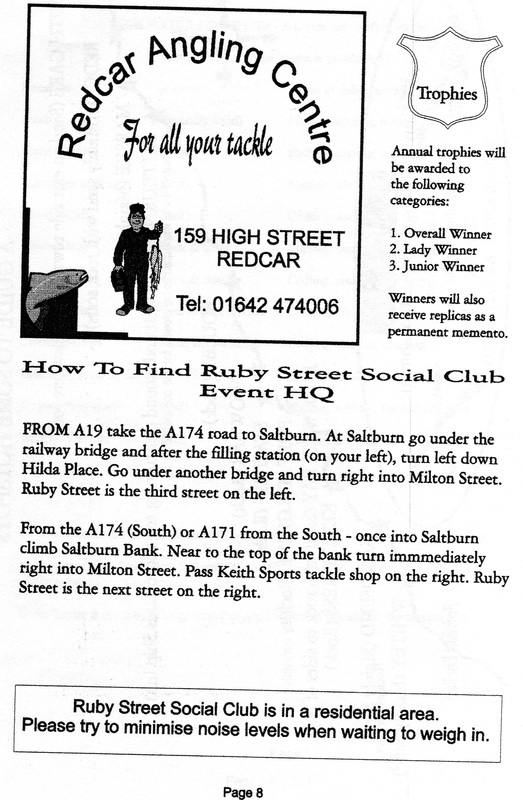 The Redcar Navy & Gentlemans Open, 7th January 2001. The Ship Inn Open, 7th January 2001. 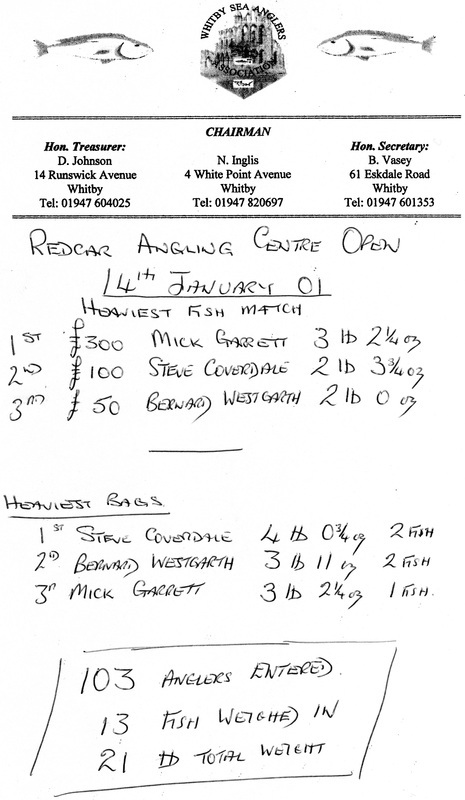 Redcar Angling Centre Open, 14th January 2001. Whitby Sea Anglers Association are now half way through the winter shore season as Ian Russell takes over the lead up to the Christmas break catching yet another double figure bag of fish in the clubs 3 hr evening match. He weighed in 7 fish for 23 lb 10 oz, the heaviest single fish tipped the scales at 7 lb 02 oz. His total weight for the season is now 141 lb 10 oz from 73 fish. In second place was Colin Stainthorpe with his best bag of fish in the club with 3 fish for 14 lb 15 oz, one of 6 lb 06 oz. The sea conditions had changed round to a south south easterly swell but not a lot of colour in the water as the tide flooded in from a low water ebb. 1st - Ian Russell - 23 lb 10 oz - 7 fish. 2nd - Colin Stainthorpe - 14 lb 15 oz - 3 fish, one of 6 lb 06 oz. 3rd - Rob Allison - 7 lb 07 oz - 5 fish. 4th - Phil Mead - 7 lb 05 oz - 2 fish. 5th - Neil Inglis - 6 lb 11 oz - 4 fish. 6th - Brian Harland - 5 lb 04 oz - 3 fish. 7th - Mike Vasey - 5 lb 03 oz - 3 fish. 8th - Denis Thompson - 4 lb 04 oz - 3 fish. 9th - Norman Brittain - 3 lb 10 oz - 2 fish. 10th - James Gilpin - 2 lb 14 oz - 1 fish. 11th - Farron Trueman - 2 lb 10 oz - 1 fish. 12th - Paul Kilpatrick - 2 lb 04 oz - 1 fish. 13th - Dave Perrett - 2 lb 00 oz - 1 fish. 14th - William Atkinson - 1 lb 10 oz - 1 fish. Ian Russell - 141 lb 10 oz - 73 fish. Neil Inglis - 124 lb 07 oz - 68 fish. Rob Allison - 98 lb 05 oz - 58 fish. Denis Thompson - 86 lb 02 oz - 48 fish. Norman Brittain - 70 lb 14 oz - 40 fish. 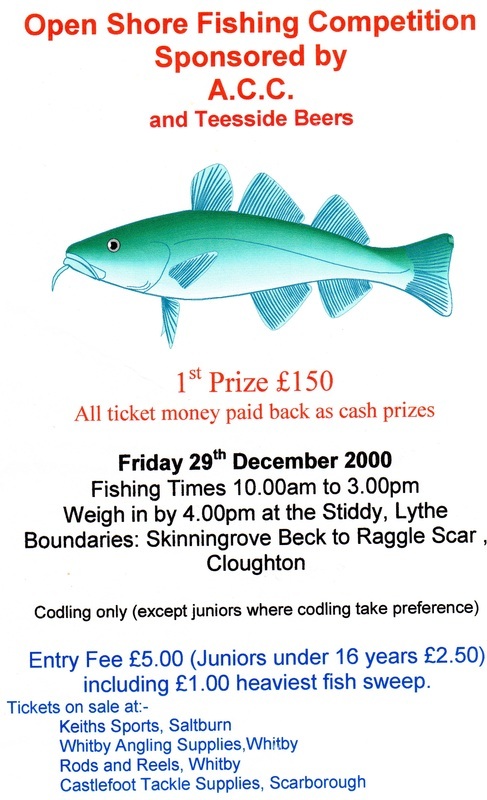 The Stiddy Open angling competition on Friday 29th December 2000 at Lythe thanks to John at the Stiddy and sponsored by Associated Co-operatives Creameries and Teesside Beers. A fairly heavy snow fall did not deter anglers as 58 fished a north westerly sea swell and a brisk wind, 18 anglers weighed in a total of 103 lb from 45 fish. The first place prize of £150 for the heaviest bag of codling was won by Andy Crowe, of Scarborough, with 3 fish for 13 lb 00 oz. The second place prize of £80 was won by Neil Inglis, of Whitby, with 5 fish for 12 lb 01 oz. The third place prize of £40 was won by Mick Ellis, of Scarborough, with 3 fish for 11 lb 06 oz. The sweep for the heaviest single fish was won by Andy Crowe 6 lb 01 oz, second Mick Ellis 5 lb 13 oz. 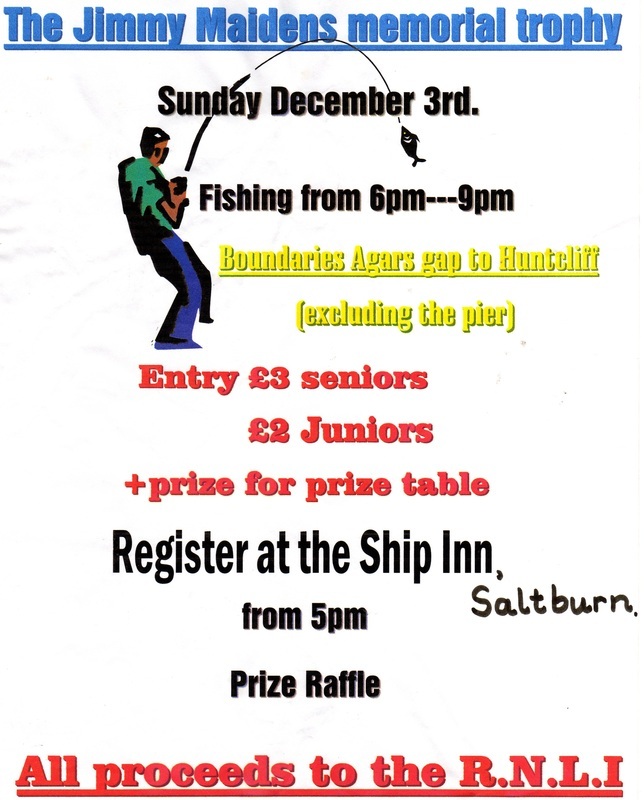 The Annual Ship Inn Open with 86 anglers entering and fishing from 1pm to 7pm for the heaviest single codling. ​They were fishing a relatively calm sea with close to shore sea swell and a strong westerly wind and a top of the tide into ebbing sea. 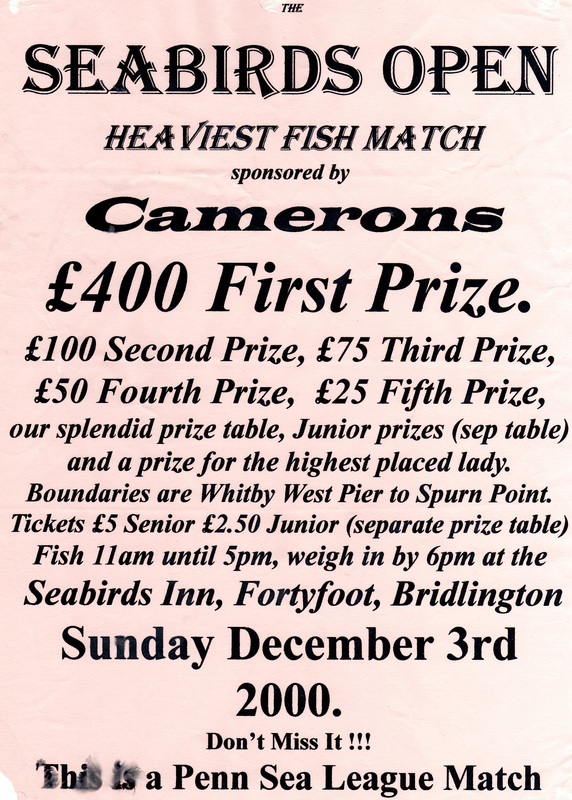 The first place prize of £300 and the Whitby Gazette Rose Bowl Trophy were awarded to Wayne Ruddock, of Middlesbrough by landlady Barbara Tyler weighing in a single cod of 6 lb 13 oz. The second place prize of £150 was won by Rob Allison, of Loftus 6 lb 08 oz. The third place prize of £75 was won by Bernard Westgarth, of Darlington 5 lb 09 oz. A prize of £25 for the heaviest bag of codling was won by Bernard Westgarth with 3 fish for 10 lb 15 oz. Unfortunately no juniors weighed in. A total of 26 fish were weighed in for a weight of 60 lb 02 oz. 1st - Wayne Ruddock - 6 lb 14 oz. 3rd - Bernard Westgarth - 5 lb 09 oz. 4th - D Smith - 5 lb 05 oz. 5th - Bernard Westgarth - 3 lb 12 oz. 7th - M Jackson - 2 lb 10 oz. 8th - Wayne Ruddock - 2 lb 09 oz. 10th - D Butterfield - 2 lb 02 oz. 11th - Bernard Westgarth - 2 lb 00 oz. 14th = Bernard Westgarth - 1 lb 10 oz. 14th = M Chadwick - 1 lb 10 oz. 17th - J Moore - 1 lb 09 oz. 18th - P France - 1 lb 08 oz. 19th = M Chadwick - 1 lb 07 oz. 19th = D Readman - 1 lb 05 oz. 21st = M Chadwick - 1 lb 05 oz. 21st = D Readman - 1 lb 05 oz. 26th - T Allwood - 0 lb 13 oz. ​As reported by Bernard Vasey 6th Jan 2001. 18 WSAA members entered and 5 weighed in!! 6 lb 08 oz - 1 fish. 5 lb 15 oz - 3 fish. 1 lb 10 oz - 1 fish. 1 lb 04 oz - 1 fish. 1 lb 00 oz - 1 fish. 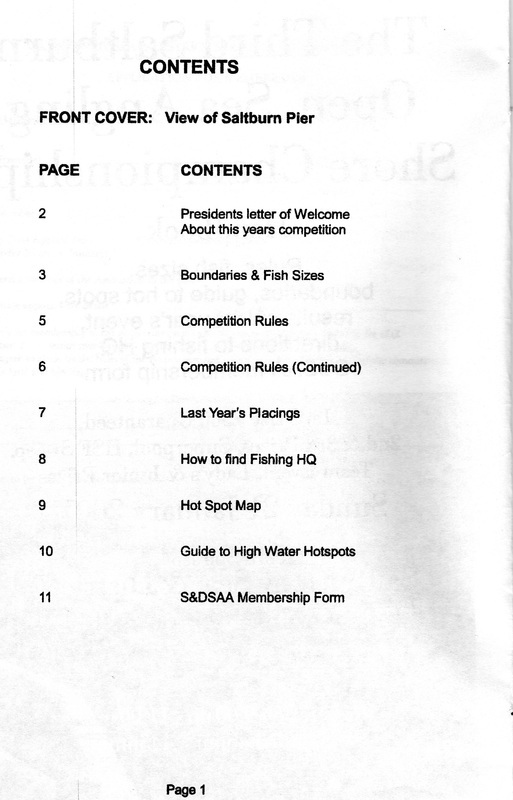 6 members fished and no on from WSAA weighed in. 1st - £300 - Mick Garrett - 3 lb 02¼ oz. 2nd - £100 - Steve Coverdale - 2 lb 03¾ oz. 3rd - £50 - Bernard Westgarth - 2 lb 00 oz. 1st - Steve Coverdale - 4 lb 00¾ oz. 2nd - Bernard Westgarth - 3 lb 11 oz. 3rd - Mick Garrett - 3 lb 02¼ oz. There was very little movement in the sea as the tide flooded in for the start of Whitby Sea Anglers Association 3 hr evening match. It turned out to be a quite cold night and bites were scarce with a total of 12 assorted fish being weighed in, codling, whiting and billet. Brian Harland - 2 lb 04 oz - 4 fish. 2nd - William Atkinson - 1 lb 11 oz - 1 fish. 3rd - Rob Allison - 1 lb 06 oz - 2 fish. 4th - Farron Trueman - 1 lb 00 oz - 2 fish. 5th - Dave Perrett - 0 lb 13 oz - 1 fish. A lot more fish were caught in the 4 hr Sunday match with a total of 32 fish from 10 members of Whitby Sea Anglers Association. A growing south easterly ebbing tide created rough conditions but there was still no colour in the water as the swell had just increased on that tide. William Atkinson had his first double figure and best bag this season winning the match. 1st - William Atkinson - 14 lb 07 oz - 7 codlings. 2nd - Neil Inglis - 9 lb 05 oz - 5 fish. 3rd - Ian Russell - 8 lb 10 oz - 4 fish. 4th - Dave Perrett - 7 lb 10 oz - 3 fish, heaviest fish of the night 3 lb 12 oz. 5th - Denis Thompson - 7 lb 03 oz - 4 fish. 6th - Rob Allison - 4 lb 07 oz - 2 fish. 7th - Norman Brittain - 4 lb 01 oz - 3 fish. 8th - Brian Harland - 3 lb 10 oz - 2 fish. 9th - Mike Vasey - 2 lb 10 oz - 1 fish. 10th - Paul Kilpatrick - 1 lb 06 oz - 1 fish. Although it was a dry night for the Whitby Sea Anglers Association members midweek match, it was also another bitterly cold one, and fishing a calm top of the tide sea there were only 3 members at the scales. 1st - William Atkinson - 4 lb 05 oz - 1 fish. 2nd - Ian Russell - 1 lb 14 oz - 1 fish. 3rd - Brian Harland - 1 lb 05 oz - 1 fish. Wintry conditions had arrived for the competition with heavy snow showers and strong cold easterly winds, but at least there were rough sea conditions from a south easterly swell bringing fish closer in to feed. There were double figure bags weighed in by Glen Kilpatrick and Rob Allison. 1st - Glen Kilpatrick - 14 lb 01 oz - 6 fish, one of 6 lb 09 oz. 2nd - Rob Allison - 7 lb 12 oz - 4 fish. 3rd - Ian Russell - 7 lb 12 oz - 4 fish. 4th - William Atkinson - 6 lb 06 oz - 3 fish. 5th - Norman Brittain - 5 lb 14 oz - 2 fish. 6th - Dave Perrett - 4 lb 09 oz - 3 fish. 7th - Colin Stainthorpe - 4 lb 06 oz - 3 fish. 8th - Neil Inglis - 3 lb 02 oz - 2 fish. 9th - Phil Mead - 2 lb 08 oz - 2 fish. 10th - Paul Kilpatrick - 2 lb 08 oz - 1 fish. A perfect tide to fish the scaurs produced 3 double figure bags and better size codling in the 4 lb, 5 lb and 6 lb range with a total of 29 fish gracing the scales from Whitby Sea Anglers Association members. The match started with the tide at half ebb to an easterly calming sea from Sundays and Mondays rough conditions putting plenty of colour back in the water. William Atkinson won the match as he continued to produce another good size codling of 6 lb 12 oz. 1st - William Atkinson - 19 lb 08 oz - 5 fish, one of 6 lb 12 oz. 2nd - Paul Kilpatrick - 14 lb 09 oz - 6 fish. 3rd - Brian Harland - 14 lb 02 oz - 3 fish, one of 6 lb 02 oz. 4th - Farron Trueman - 6 lb 01 oz - 1 fish. 5th - Phil Mead - 4 lb 13 oz - 3 fish. 6th - Bernard Vasey - 4 lb 05 oz - 2 fish. 7th - Mike Vasey - 3 lb 07 oz - 2 fish. 8th - Philip Kilpatrick (Jnr) - 3 lb 00 oz - 1 fish. 9th - Ian Russell - 2 lb 06 oz - 1 fish. 10th - Neil Inglis - 2 lb 03 oz - 2 fish. 11th - Glen Kilpatrick - 1 lb 13 oz - 1 fish. 12th - Dave Perrett - 1 lb 09 oz - 1 fish. 13th - Rob Allison - 1 lb 04 oz - 1 fish. The sea was calm for the evening match, fishing a 5.8 metre high tide, with very few bites it seemed a long night as 6 Whitby Sea Anglers Association members weighed in 8 fish. The best bag of 3 lb 00 oz, 2 fish from Farron Trueman won the event. 1st - Farron Trueman - 3 lb 00 oz - 2 fish. 2nd - Denis Thompson - 2 lb 11 oz - 2 fish. 3rd - Paul Kilpatrick - 2 lb 10 oz - 1 fish. 4th - Philip Kilpatrick (Jnr) - 1 lb 09 oz - 1 fish. 5th - Brian Harland - 1 lb 04 oz - 1 fish. 6th - William Atkinson - 0 lb 09 oz - 1 fish. 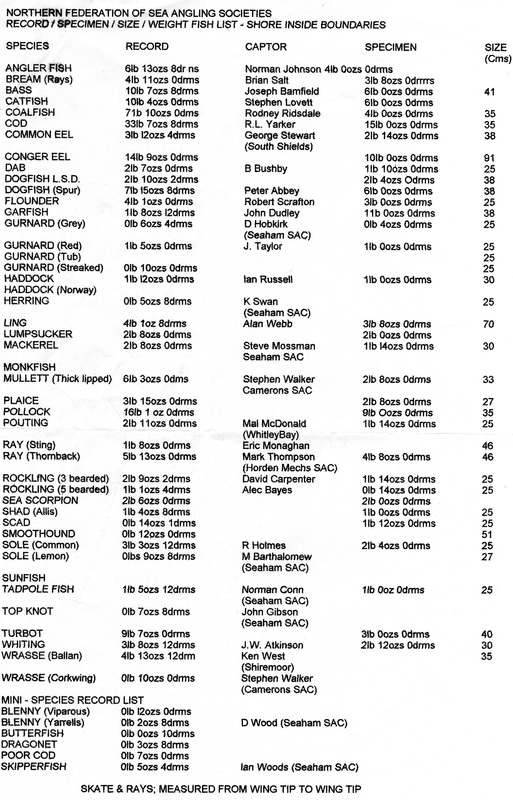 The heaviest fish caught out of a club match goes up from 9 lb 07 oz, weighed in by Neil Inglis to 10 lb 03 oz from Mike Vasey on Monday 5th February 2001. The sea conditions were calm once again for the club match, with no movement or little motion the tide was at half flood on a fine evening. 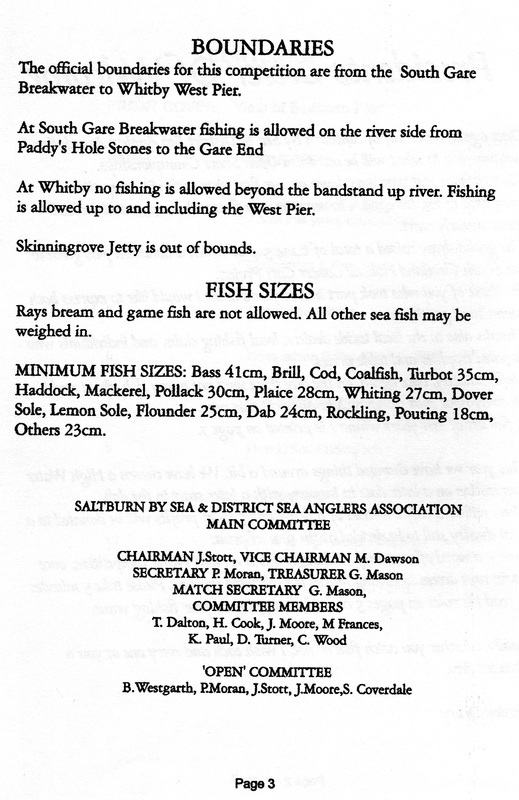 Only 3 fish were weighed in by Whitby Sea Anglers Association members. 1st - Denis Thompson - 1 lb 07 oz - 1 whiting and 1 plaice. 2nd - Rob Allison - 0 lb 12 oz - 1 whiting. The Sunday night match for Whitby Sea Anglers Association members was a much better result as the sea had a slight north westerly movement creating enough sea swell close to shore. There was 1½ hrs of ebb still left as members started to fish with the best catches coming during this time as Rob Allison picked his mark and landed his catch of 6 codling for 16 lb 04 oz, his best 7 lb 01 oz, now the heaviest fish for February. 1st - Rob Allison - 16 lb 04 oz - 6 codlings. 2nd - Phil Mead - 5 lb 13 oz - 3 fish. 3rd - Neil Inglis - 5 lb 00 oz - 3 fish. 4th - William Atkinson - 4 lb 08 oz - 2 fish. 5th - Bernard Vasey - 3 lb 01 oz - 2 fish. 6th - Adrian Nelson - 2 lb 09 oz - 1 fish. 7th - Norman Brittain - 2 lb 08 oz - 1 fish. 8th - Dave Perrett - 1 lb 09 oz - 1 fish. 9th - Brian Harland - 1 lb 01 oz - 1 fish. Good sea conditions produced a 10 lb 01 oz and 7 lb 07 oz cod for longest serving member of Whitby Sea Anglers Association, William Atkinson, and with a north westerly rough swell, fishing an ebbing tide, he caught his third double figure bag of the season. It was a growing sea, with long distance swells running in, which were possibly a little too heavy at times keeping the fish out of casting distance. A total of 14 fish were weighed in. 1st - William Atkinson - 21 lb 14 oz - 4 fish, 2 of which 10 lb 01 oz and 7 lb 07 oz. 2nd - Glen Kilpatrick - 6 lb 15 oz - 3 fish. 3rd - Norman Brittain - 5 lb 08 oz - 2 fish. 4th - Dave Perrett - 3 lb 00 oz - 1 fish. 5th - Rob Allison - 2 lb 10 oz - 2 fish. 6th - Brian Harland - 1 lb 14 oz - 1 fish. 7th - Farron Trueman - 1 lb 00 oz - 1 fish. 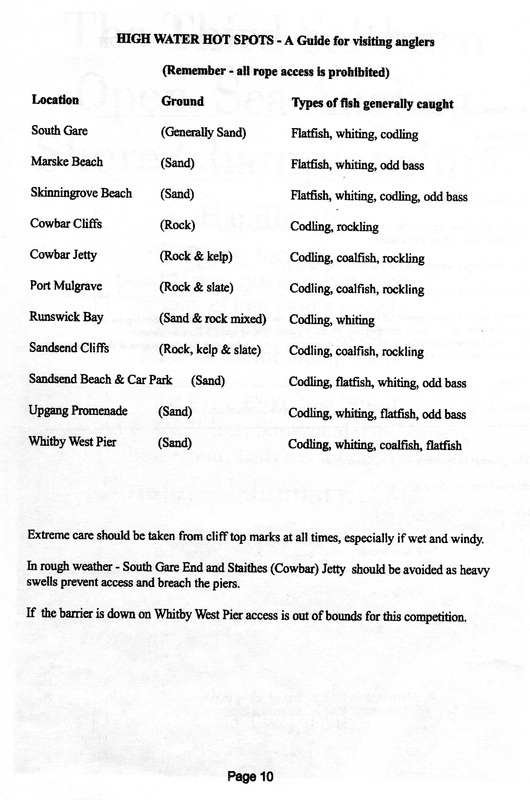 The rough seas were still here and a high tide for the Whitby Sea Anglers Association Sunday competition, with a north westerly swell and a high water 5.4 metre tide. Members were wondering where to fish as some marks were a little too rough. As the tide ebbed the swell fell and this proved the prime time to catch fish, a total of 22 were returned to the scales, the best bag from Rob Allison with 9 lb 13 oz from 4 fish. Heaviest fish of the night falling to Peter Horbury 5 lb 03 oz, taking 2nd place with 3 fish for 9 lb 02 oz. 1st - Rob Allison - 9 lb 13 oz - 4 fish. 2nd - Peter Horbury - 9 lb 02 oz - 3 fish. 3rd - Ian Russell - 7 lb 03 oz - 4 fish. 4th - Philip Kilpatrick (Jnr) - 5 lb 11 oz - 2 fish. 5th - Bernard Vasey - 4 lb 12 oz - 2 fish. 6th - Norman Brittain - 4 lb 02 oz - 2 fish. 7th - Paul Kilpatrick - 3 lb 09 oz - 2 fish. 8th - Denis Thompson - 2 lb 08 oz - 1 fish. 9th - Farron Trueman - 1 lb 15 oz - 1 fish. 10th - Dave Perrett - 1 lb 03 oz - 1 fish. Whitby Sea Anglers Association members were again spoilt for choice in which mark to fish in the clubs competition as another rough sea swell was running for a top of the tide into ebb event. It was a cold night as the wind had turned into the north east, with frequent snow showers, there was loose weed which proved a problem on the line but once the tide had turned the fish began to show. A total of 22 codlings were caught with yet another big fish from William Atkinson winning with a bag of 13 lb 09 oz, he had an 8 lb’er amongst his catch of 3 fish. 1st - William Atkinson - 13 lb 09 oz - 3 fish. 2nd - Bernard Vasey - 12 lb 02 oz - 3 fish, one of 7 lb 06 oz - his best this season. 3rd - Ian Russell - 11 lb 08 oz - 5 fish. 4th - Rob Allison - 8 lb 00 oz - 4 fish. 5th - Graham Wright - 7 lb 06 oz - 3 fish. 6th - Denis Thompson - 3 lb 06 oz - 2 fish. 7th - Dave Perrett - 2 lb 03 oz - 1 fish. 8th - Phil Mead - 1 lb 12 oz - 1 fish. Ian Russell (1st place overall) now leads with 200 lb from 101 fish. The sea state had calmed and the weather had turned very cold as Whitby Sea Anglers Association members fished a flooding tide, only 2 fish were caught. 1st - William Atkinson - 0 lb 08 oz - 1 fish. 2nd - Rob Allison - 0 lb 07 oz - 1 fish. Miles of public footpaths and bridleways have now been closed due to the ‘foot & mouth’ crisis, closure notices have been posted, as well as rambles, anglers must not use these paths to reach fishing marks. William Atkinson returned to the scale with yet another heavy fish of 8 lb 04 oz. There was a south easterly with enough sea swell to put plenty of colour in the water to stir the fish into moving in, with a total of 17 codlings weighed in. 1st - William Atkinson - 12 lb 02 oz - 3 fish, one of 8 lb 04 oz. 2nd - Neil Inglis - 4 lb 15 oz - 2 fish. 3rd - Colin Stainthorpe - 4 lb 11 oz - 3 fish. 4th - Brian Harland - 3 lb 06 oz - 2 fish. 5th - Denis Thompson - 2 lb 15 oz - 2 fish. 6th - Glen Kilpatrick - 2 lb 13 oz - 1 fish. 7th - Mike Vasey - 2 lb 12 oz - 2 fish. 8th - Phil Mead - 2 lb 11 oz - 1 fish. 9th - Dave Perrett - 2 lb 03 oz - 1 fish. Neil Inglis was very unlucky as he lost a descent fish in the tangles. It was a quite night for Whitby Sea Anglers Association members with only 2 fish to weigh in, fishing a 5.9 metre high tide into ebb on a calm sea resulted in a codling and a billet taking the hook bait. 1st - Neil Inglis - 1 lb 11 oz - 1 codling. 2nd - Rob Allison - 0 lb 12 oz - 1 billet. Whitby Sea Anglers Association were kept busy in the club match as members reported plenty of small fish bites, there was only one good bite and this time it went to Neil Inglis as he hooked into and reeled in a cod of 8 lb 05 oz, now the heaviest fish for March by one ounce. A northerly sea swell and a high tide into ebbing tide produced 11 fish to the scales. 1st - Neil Inglis - 9 lb 08 oz - 1 fish, heaviest fish 8 lb 05 oz for March. 2nd - Paul Kilpatrick - 4 lb 00 oz - fish. 3rd - Denis Thompson - 2 lb 11 oz - 1 whiting & 1 dab. 4th - Colin Stainthorpe - 2 lb 05 oz - 1 fish. 5th - Ian Russell - 1 lb 06 oz - 1 fish. 6th - Rob Allison - 0 lb 08 oz - 1 fish. Neil Inglis, 14th March 2001, 8 lb 05 oz. Photograph by Neil Inglis. Neil Inglis, 14th March 2001, 8 lb 05 oz. Photograph by Bernard Vasey. A slow flooding tide and a bitterly cold windy night from a north westerly, plenty of sea swell but not enough colour in the water was fished by Whitby Sea Anglers Association members. Resulting in a total of 7 fish, all codlings being caught. 1st - Phil Mead - 4 lb 11 oz - 2 fish, one of 3 lb 04 oz. 2nd - Dave Perrett - 2 lb 14 oz - 1 fish. 3rd - Rob Allison - 2 lb 06 oz - 2 fish. 4th = Neil Inglis - 1 lb 12 oz - 1 fish. 4th = Ian Russell - 1 lb 12 oz - 1 fish. One of the most liked tides to fish, a low water into flood, failed to produce more than 5 codling from out of the tangles. Whitby Sea Anglers Association members fished a cold wet night to an easterly sea swell with very clear water, as the swell did not stir the sea bed enough as this was only top swell. 1st - Denis Thompson - 5 lb 00 oz - 2 fish, one of 3 lb 02 oz..
2nd - William Atkinson - 2 lb 00 oz - 1 fish. 3rd - Ian Russell - 1 lb 08 oz - 1 fish. It was the same conditions as Wednesday but members of Whitby Sea Anglers Association fished an ebbing tide , easterly sea swell with most of the math fished in daylight as the clocks had gone forward one hour. There were only 5 codlings weighed in, the best bag of 2 fish was won by Rob Allison. 1st - Rob Allison - 3 lb 03 oz - 2 fish. 2nd - Neil Inglis - 2 lb 07 oz - 1 fish. 3rd - Dave Perrett - 2 lb 06 oz - 1 fish. 4th - Paul Kilpatrick - 1 lb 14 oz - 1 fish. As reported by Bernard Vasey to the Whitby Gazette.